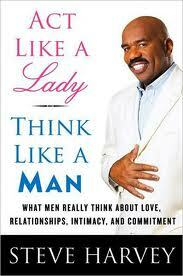 Last year (July 2009) I wrote a post on Steve Harvey's Act Like a Lady, Think Like a Man after watching his interview on Oprah which I watched in South Korea. A year and some later...today (Wednesday, December 1, 2010) I started reading the book. Steve Harvey is a likable character and even though watching him on screen, it seems like he could be one of your friends who you'd call up for a pick-me-up. I guess that's why I was hooked from page 1. The book, Act Like a Lady, Think Like a Man has the author taking its readers (presumably women) on a guided tour of a man's mind. As I write this post, I'm only on page 42. I'm not finding "revelations" as such as I've already known certain things about the male species (example: men need to feel needed) but in keeping my focus on the author, allow me to share with you what I've "learned" today. ...everything he does is filtered through his title (who he is), how he gets that title (what he does), and the reward he gets for the effort (how much he makes). These three things make up the basic DNA of manhood - the three accomplishments every man must achieve before he feels like he's truly fulfilled his destiny as a man. A man who professes you as his own is also saying in not so many words that he's claiming you - that you are his. Providing for the ones he loves and cares about, whether it's monetarily or with sweat equity, is a part of a man's DNA, and if he loves and cares for you, this man will provide for you all these things with no limits. When a man truly loves you, anybody who says, does, suggests, or even thinks about doing something offensive to you stands the risk of being obliterated. I went to an all girls school and was raised with the belief that women should be independent - on all levels. Of course, this also means being financially independent. So when a guy asks me (hypothetically) out, I should offer to pay for my half - right? Even if he insists on paying, just the gesture or offer should speak volumes about my personality, should it not? No! Mr Harvey clearly says on page 28 - in italics, nogal! Know this: It is your right to expect that a man will pay for your dinner, your movie ticket, your club entry fee, or whatever else he has to pay for in exchange for your time. I'm really enjoying this book. More on it later... have to get back to reading now!